Hi all, Mal here, Bichonpoo extraordinaire. Living on Mackinac Island Michigan is one sweet treat. We've got world famous fudge, quaint horse and buggy transportation and wonderful friends. My personal favorite is bicycles. I love to chase them or even better ride in my human, Allie McMurphy's basket on the front of the bike. Nothing like the feel of the wind blowing in your hair on a cool summer's day. I'm busy keeping Allie safe from bad guys and in "To Fudge or Not To Fudge", I'm busy showing her where the bodies are buried. Well not exactly buried but hidden in the mulch under the lilac bushes. It's Lilac Festival Time on Mackinac and everyone is ready for the big parade and all the wonderful celebrations. Allie has no time to invest in the bones I keep digging up, but it's important that she takes me seriously because the bad guys will soon be coming for her. No worries, though. When they do, I'll be there ready to keep Allie safe. Oh and I'm supposed to tell you that this month "All Fudged UP" is only $1.99 on Kindle. 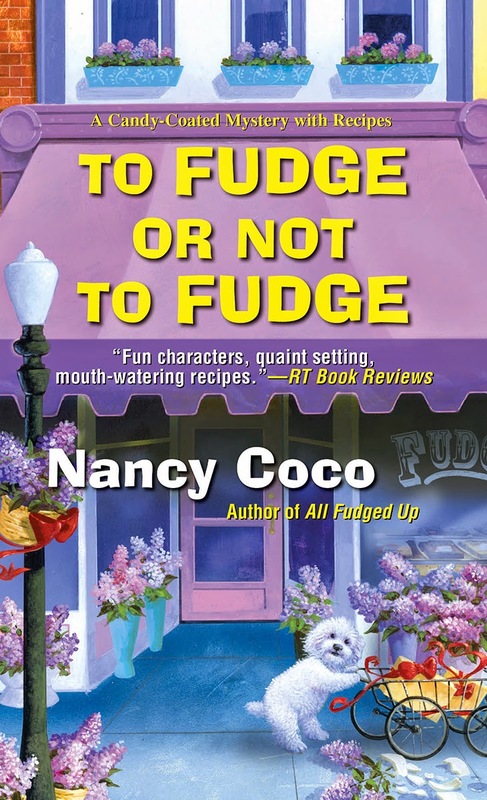 Read it now so that you'll be ready when "To Fudge or Not To Fudge" comes out September 2nd. 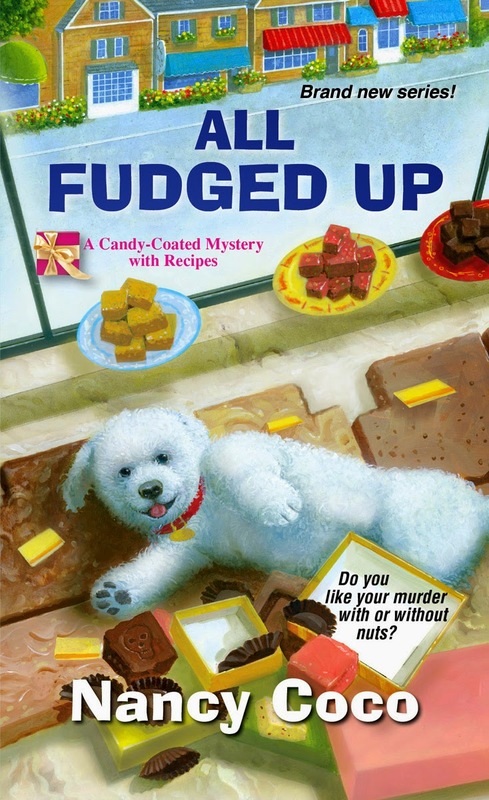 A new mystery and fresh fudge recipes you can preorder here. Oh and my writer says to leave a comment on your favorite vacation destination for a chance to win a copy of "All Fudged Up" as paperback. And also- you can find this series available on Audible, too if you prefer to listen to you mysteries. My favorite vacation destination is Cape Breton Island in Nova Scotia. I've been all over the U.S. and much of Canada and have never found anywhere that rivals its beauty. I like to go someplace I haven't been before. It's fun exploring new places. New Orleans is my favorite. History, music, food... Great! In the mountains, of Virginia. I already have my copy and have started reading it.. But my favorite vacation spot is a hard question... We have 2 of them. P-Town in Ma. and Colonial Williamburg in Va. This year though we are doing a Rita Mae Brown vacation. We're going to Albermarle County, Va and stopping in Crozet to see if we can spot Harry Harristeen. Then visit some Presidential homes and finish up in a cabin on the river in Luray. The white sand beaches are awesome- especially in the winter when Mackinac is covered in snow. Vacation? Downeast Maine. Wonderful places and people. My favorite vacation destination is my boyfriend's lake house in beautiful upstate New York! I agree that upstate New York is so pretty especially in the Fall. Currently my favorite vacation spot is my house- I just enjoy taking time off for myself- but I don't think that's what you want so I would have to say Roan Mountain, NC. However, I would love to visit Alaska. We just took a three week vacation trip to Ireland. It was a fabulous trip. I would go back in a minute. I enjoy this series very much. Since I have so many furkids, I don't travel. I do, however, take day trips. There are so many great things to see and do around Western NY, I don't feel limited at all! I used to live ten minutes from Western NY - so I know how lovely it is. I love to head up to the coast. I could watch the ocean for hours. Thanks, Kiki. We love the ocean, too. My favorite vacation spot is Plum Island, MA. Just pre-ordered your new book & will buy the 1st book (if I don't win it!) with the Kindle special. Have never gone on a cruise, but would like to take an Alaskan cruise. Otherwise, Cambria California is a nice place. Hi Donna, I've never been to Cambria. I'll have to check it out. London or any where in New England. We put everyone's name in a hat and Mal pulled out the winner: Renee W. I'll be sending you an email to get your mailing address. We love going to VA beach.